Sealaska Heritage Institute (SHI) will open its eighth, biennial Juried Art Show next week and give awards in five divisions. For the first time, the show will include a display of exemplary works by some of the most acclaimed Northwest Coast artists alive today. The institute also will give awards to participants of its new Juried Art Youth Exhibit during the ceremony, held during Celebration 2016. Carving and sculpture, which includes categories for wood and metal carvings and sculptures; sewing, which includes categories for skin and fur, beadwork and other; weaving, which includes categories for Chilkat, Ravenstail and basketry; two-dimensional, which includes categories for paintings, drawings and prints. Artists who win Best of Category will compete for Best of Division, and the division winners will compete for the Best of Show prize. SHI also will award a Best Formline prize for the best formline design among all pieces submitted. Jurors were the acclaimed artists Stephen Paul Jackson and Nicholas Galanin. Shgen Doo Tan Robyn Kay George served as juror consultant for the weaving/sewing divisions. Jurors reviewed the pieces blindly, meaning the names of artists who submitted pieces were not disclosed. The theme for the Juried Art Show and Competition is “Art and At.óow.” The awards ceremony is scheduled 4 pm, Wednesday, June 8, at the Walter Soboleff Building, and the show will be on exhibit immediately after the ceremony through Sept. 30 in the Nathan Jackson Gallery. The pieces in the new “Exemplary Works” exhibit were made by artists who were chosen to make the three monumental art pieces for the Walter Soboleff Building and two of the Northwest Coast art experts who serve on SHI’s Native Artist Committee. Featured artists include David A. Boxley, Delores Churchill, Robert Davidson, Nathan Jackson and Preston Singletary. The exemplary pieces featured reflect the best of the art form today as learned from the old masters and underscore the institute’s quest to recognize Northwest Coast art as a national treasure. The “Exemplary Works” exhibit also will be shown in the Nathan Jackson Gallery. The Juried Youth Art Exhibit will showcase 35 pieces and include 34 objects made by 28 individual young artists and one artwork that was made by 61 6th grade students from Dzantik’I Heeni Middle School. SHI will award $350 for first place and $200 for second place for competitors in middle school. The institute will award $500 for first place, $350 for second place and $200 for third place for competitors in high school. The funds will go to the school or organization identified by the winners that gave them instruction in Northwest Coast art. Individuals or groups that sponsor the show will be invited to hand out prizes in the divisions they supported. All youth chosen to exhibit will receive a specially-made Juried Art Show t-shirt and winners also will receive a certificate. The juror for the youth event was Lance Twitchell. The competition was open to all youth in grades 6-12. 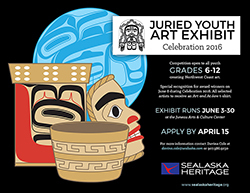 The youth exhibit will open on June 3 at the Juneau Arts and Culture Center and run through June 30.